For years Thredbo Mountain Biking has been known as the home for the expert downhill mountain bike rider who wants to tackle the steep, challenging trails from the top of the mountain using the chairlift for access. That is all set to change now with the first in a series of new trail developments that will see Thredbo become one of the countries leading mountain bike riding destinations with terrain and trails to suit all levels of rider. This summer, the the Thredbo Valley Track is open running 19km from Friday Flat to the Ski Tube offering family friendly riding in a spectacular setting. On the mountain the Kosciuszko Flow Track is open offering the thrill of chairlift accessed downhill riding without the spill. This easier track from the top of the Kosciuszko Express chairlift will allow anyone who is a competent cross country rider to take their own bike and ride the chairlift. With new pricing for both chairlift access and bike hire, if you don’t have your own bike you can rent a state of the art downhill bike from Thredbo MTB in the valley terminal ticket office. You can also hire bikes, helmets and body armour from Thredbo MTB. Please note, to ride the chairlift with your bike you will need to complete a one off safety induction course at a cost of $30. All riders on the mountain riding chairlift accessed trails need a full face helmet. 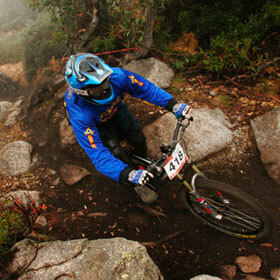 Want to try Downhill Mountain Biking? Book our Mountain bike weekend with 3 nights accommodation, 2 days bike and equipment hire, 3 days chairlift access from only $515 per person, even less if you bring your own bike.